Comments Off on Action or Contemplation or…? The Active Life, by Parker J. Palmer (New York: Jossey-Bass, 1990), 162 pbk. Quaker educator and social activist­ Parker Palmer is best known for The Courage to Teach and other books on the vocation of an educator. He lays the groundwork for an authentically Christian understanding of vocation in one of his earliest books, The Active Life. Though nearly thirty years old, it remains in print because its insights are timeless. Palmer believes we will be frustrated in our vocation if we try to maintain a false dichotomy between action and contemplation. He defines action as “any way that we co-create reality with other beings and with the Spirit,” while contemplation is “any way that we can unveil the illusions that masquerade as reality” (17). It is naïve to think we can allocate our time between action and contemplation because they are different facets of the same calling. This insight came as Palmer tried to enter monastic life. Christian spirituality in the late twentieth century stressed the importance of monastic practices—especially solitude, recollection, and prayer—so Parker supposed he had to become a monk to achieve spiritual maturity. He soon realized that he didn’t have enough detachment from material concerns to devote himself to these practices. He was an activist. He could not merely be a spectator or commentator in the face of social injustice. He had to do something to combat it, even if the effort was futile. Palmer further learned that action and contemplation are not separate compartments of an authentic Christian life, but the connected poles of a living paradox. A Christian engages in both simultaneously. Perhaps the most helpful insight of The Active Life is its distinction between instrumental action (what we do to accomplish specific results) and expressive action (what we do to demonstrate our own gifts or viewpoints). Modern society is preoccupied with ­­­­success or failure (the goal of instrumental action), while a Christian is called to authentic personhood (the goal of expressive action). Palmer devotes much of the book to a commentary on poems from Taoist, Hasidic, and Latin American Catholic cultures that explore the spiritual significance of vocation. Some of these comments are obviously contrived to read Palmer’s conclusions back into them. However, his discussion of Julia Esquivel’s “Threatened by Resurrection” well reveals how a poet can use irony to provoke our reflection on the deepest truths of life. Esquivel says that when revolutionaries threaten to destroy our accustomed way of life, they “threaten us with resurrection.” Likewise, the revolutionary impulses of an individual’s heart. When we boldly attempt to actualize the purpose for which we were created (through action), we discover what is false in our lives (through contemplation). Those false characteristics and impulses must die, yet beyond the pain of death we find resurrection. I listened and made some notes. His predicament is all too common among Christians. In our rush to make a livelihood, we have forgotten our goals for life. So when we come to a critical juncture, such as the last decade before retirement, we feel anxiety and fear. We don’t know where we’re going. We have no long-range goals. This is why I believe we should study what God’s Word says about our life goals. How does God say we should set long-range goals? How does He say we can reevaluate our goals when life changes drastically and unexpectedly? These are the questions we will tackle in this book. You will find some practical tools for goal-setting as well as step-by-step procedures for reevaluating your life goals at crucial decision points, such as this government worker was facing. More important, you will be challenged to consider how your daily plans fit into the big picture of lifelong goals. You will gain a fresh perspective on the way God reveals His will to you. In short, this is more than a nuts-and-bolts manual of life planning; it’s an invitation to reassess your relationship with God. 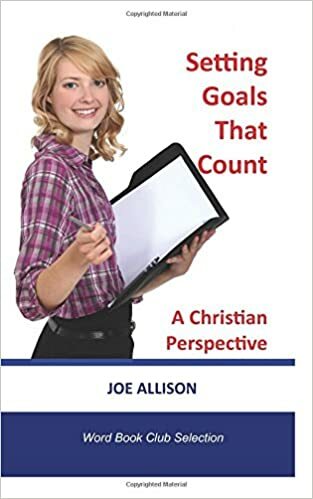 A Christian does goal-setting and plan-making within the context of this relationship, while a non-Christian sets goals and makes crucial decisions without the benefit of it. We will come back to this matter repeatedly and test your aspirations against Scripture to see whether they are godly aspirations, because we feel most satisfied when we strive to become the persons God created us to be. A personal relationship with God—intimate communion with Him—is essential to Christian goal-setting. Throughout this book, you will be called to reexamine your relationship with Him. First, we ought to understand the difference between a goal and a plan. We often get the two confused. “Exactly what do you have in mind?” you might ask. “How much weight do you hope to lose?” you ask. Now that is a goal! It is the end toward which I am aiming. It is the destination I am trying to reach. All the other steps—the menus, the exercise routines, the targets for each week’s weight loss—are simply means for reaching my ultimate destination. That destination is my real goal. For this reason, I’m not too upset if I forget my New Year’s resolutions by Ground Hog’s Day. I won’t wring my hands and say, “Oh, no, I’ve really failed!” Because resolutions are not really my goals; they are simply plans for reaching my goals. And if one plan fails, I can try another. See the difference? The “do” sentences described a plan of action, while the “be” sentences described the result of that action. Your plans are how you intend to reach your destination; but your goals are your destina­tion. Keep sight of your goals—what you intend to “be.” Instead of thinking about what you will do in the next year, think about who you will become. That really is your goal. I believe many Christians act unwisely because they are so busy with short-range plans that they don’t take stock of their goals, or they are so absorbed with the daily strategies of living that they forget about their goals. They don’t know if they have reached today’s goals or if they are any closer to tomorrow’s. They are obsessed with what they’re going to do, but they don’t consider who they will become. If you want to become the person God created you to be, I urge you to set goals before you start making plans. God influences a Christian’s goal-setting and plan-mak­ing through a kind of spiritual internal guidance system. When engineers designed the Mars Rover spacecraft, they gave it a computerized internal guidance system. Earth-based flight crews could not manually steer it to its destination over fifty million miles away. If they erred by even a fraction of an inch, they would miss the target by hundreds of miles. So microcomputers were stowed in the belly of that spacecraft to steer it and ground crews left the “driving” to that internal guidance system. Granted, our hearts sometimes go wrong. We must take readings against God’s Word and the counsel of other Christians to make sure our hearts keep us on God’s true course. But God does steer us inwardly, so we should pay attention to our innermost aspirations. When our “hearts” are properly tuned to the Lord, they will point us toward serving Him. and they shall be my people (Heb 8:10). This verse suggests two distinct functions when it says God will “put” His law into His people’s minds and “write” it upon their hearts. The word put suggests temporary change, while write indicates more permanent change. We still observe this distinction. We often say, “I’ve changed my mind,” yet seldom say, “I’ve changed my heart.” The mind is a part of our internal guidance system that seems capable of being quickly reprogrammed, while the heart isn’t. To carry out the spacecraft analogy, we could say the heart the “wired circuit” of our personal guidance system, while the mind is more like the random access memory (RAM) of a computer chip—quickly changed and reprogrammed. The Lord saw that the wickedness of humankind was great in the earth, and that every inclination of the thoughts of their hearts was only evil continually (Gen 6:5). and stir up wars continually (Psa 140:1‒2). The psalmist knew that every ungodly person has the same basic problem—”heart disease.” An evil person’s heart is not right, so the life purpose is not right. As the King James puts it, such a person makes “mischief” with other people’s lives. When a mischievous heart steers a person, every decision and plan springs from its malevolent purpose. We cannot expect that we, as basically selfish people, will act differently until God changes the goal-setting center of our lives. He can do that. He can give every one of us a new character and a new vision of our future. The Old Testament man named Saul was a case in point. He was the son of a farmer, who sent him out one day to look for some stray donkeys. Saul searched and searched without success and finally decided to consult the prophet Samuel, hoping he might know where the donkeys were. However, the prophet discerned that God wanted this young man to lead the Israelites in battle against their enemies, the Philistines. He announced that Saul’s donkey-rustling days were over—he was a soldier now! Saul did not believe him. “Saul answered, ‘I am only a Benjaminite, from the least of the tribes of Israel, and my family is the humblest of all the families of the tribe of Benjamin. Why then have you spoken to me in this way?” (1 Sam 9:21). The prophet was undeterred. He knew God’s purpose for Saul, so he predicted that God would give him several signs to prove he should take this new assignment. Third, Saul would meet a band of prophets singing, dancing and prophesying as they traveled down the road. This was the strangest sign of all, for Samuel said, “Then the spirit of the Lord will possess you, and you will be in a prophetic frenzy along with them and be turned into a different person” (1 Sam. 10:6, italics mine). We often think that when God gives us new goals in life, He changes only our goals. But when the Spirit of God came upon Saul, he became “another man.” The shy, quiet farm boy turned into a whirling, singing prophet. So Saul’s third sign of a God-given change in goals was a change in his personality. All three signs came soon after Saul left the prophet’s house, proving that God was calling him to be the captain of Israel. Notice verse 9: “As he turned away to leave Samuel, God gave him another heart; and all these signs were fulfilled that day” (1 Sam. 10:9, italics mine). Saul acted differently because God changed the very core of his life. He changed Saul by changing his “heart,” the seat of his goals and aspirations. Unfortunately, years later, Saul’s heart changed again. He took up the high priest’s duties, kept the spoils of battle, consulted the witch of Endor, and dis­obeyed the Lord in other flagrant ways. His personality did another about-face so that he became impulsive, volatile and vain. The wizened prophet Samuel had to denounce him and announce the selection of a new king. Notice this: Though God had changed his internal guidance system, Saul remained at the controls of his life. He could choose to heed the dictates of his changed heart or override them to suit more selfish purposes. Sadly, he chose to turn his heart away from God to serve and promote himself. He ignored the readings of his spiritual “instruments” and instead followed his own perverse de­sires. In the process, Saul wrecked his life. There are many other Old Testament examples of how God can use a person’s spiritual internal guidance system to direct goal-setting. But let’s notice what the New Testament says about the heart. The good person out of the good treasure of the heart produces good, and the evil person out of evil treasure produces evil; for it is out of the abundance of the heart that the mouth speaks (Luke 6:45). What accounts for the difference? Why do some people have hearts that honor the Lord while others don’t? A person’s own choice accounts for the difference. Each one of us decides whether to receive or to shun God’s transforming power. We decide whether to follow our re­bellious heart or receive a loyal, obedient heart for God. When Gentiles began giving themselves to Jesus Christ, Peter said, “And God, who knows the human heart, testified to them by giving them the Holy Spirit, just as he did to us” (Acts 15:8).
. . . God’s love has been poured into our hearts through the Holy Spirit that has been given to us (Rom 5:5). But thanks be to God that you, having once been slaves of sin, have become obedient from the heart to the form of teaching to which you were entrusted, and that you, having been set free from sin, have become slaves of righteousness. (Rom 6:17‒18). What a dramatic change God worked in your life when you became a Christian! He began changing you at the very core of your life—your “heart”—so He could govern everything else you do. The love of God took control of your heart, drawing you to follow His Word. Though once you were a slave of self, you now are a “slave of right­eousness.” Your heart belongs to God, and your thoughts, attitudes and actions will bear this out. That transformation may not come in an instant. Your vision of the future may evolve over a period of months, even years, as God molds your heart. You may have no clear idea of your ultimate destination, seeing only the first step of change. But as you take each step (a plan), you get a better idea of where you’re going (goal). He was sold into slavery and carried into Egypt. He was thrown into prison, falsely accused of molest­ing his master’s wife. He lay in prison fifteen years, forgotten by a prisoner he helped to free. Only when he was called to interpret a dream for Pha­raoh did Joseph become one of the most powerful men in Egypt. God says He will make the darkness into light before us, but He may do it just when we think we’re stepping off into an abyss! He says He will make the rugged places plain, but He may not do so until we are ready to step into those places. “I will make the darkness into light before them,” God says. How far before us? Perhaps just one step—when we’re ready to take it. That way, we have to follow Him by faith. How can you know whether your goals are truly God-given? How can you overcome the fear of change in order to pursue your goals? How can you shake off the numbness of indecision when several goals seem right for you? How can you know when it’s time to take another step toward your goals? From forthcoming revised edition of Setting Goals That Count: A Christian Perspective. Copyright Joseph D. Allison. All rights reserved. When I was a high-school junior, I won our state’s first science-fair competition. My entry was a paper entitled, “New Hypotheses in Cosmogony.” It was about…well, I’ll not try to explain that here. Suffice it to say, the subject was sufficiently complex that the judges may have given me the prize simply to justify the amount of time they had to invest in understanding it. Anyway, on the flight to New Jersey (still a prop plane in those days), my reverie of watching the landscape below the droning engines was interrupted by a stewardess with the beverage cart. I heard her voice but not the question on account of the props, so I said yes. “Then I need to ask whether you’re 18 years of age,” she smilingly replied. “No.” Not the question I had expected! Since this was Tennessee’s first year to enter the competition, I was last in line every step of the way. We stayed at an old hotel in the decaying seaside resort of Asbury Park, NJ, so my cell was a retrofitted broom closet on the uppermost floor. It was the off-season (January, as I recall), so the clanking steam radiator brought scarcely a breath of warmth to my stratospheric room. I soon learned to prop my door open to enjoy the rising heat from the rest of the building. A book of abstracts describing the entries in the national science fair didn’t list mine. A footnote explained that entries from Tennessee and 3 other states had been omitted (another result of our Johnny-come-lately status), so we’ll never know if my esoteric presentation would have won at the nationals. When I returned home, my teachers at Boones Creek High School invited me to tell the story at their various classes. I didn’t embellish the facts (so far as I recall), but I did share my odyssey’s colorful details–the drink I was offered, the ineffectual radiator, the egg shells, the steak lunch with Army brass, the officers’ club dance, and all the rest. And I discovered something quite unexpected: I loved to tell the story more than I enjoyed the trip itself. So I became, not a scientist, but a writer.